Recently, I stayed at a place that wasn’t my own. It was only for one night, and I had been there before. I will refrain from naming this place, mainly because I like to respect people’s privacy, but also because I’d rather not cause any static. Not that what I’m about to say is a secret, or that it insults anyone. Anyway, while I was there, I was reminded how important one’s pillow is, how essential an element for a good night’s sleep. In fact, I’d go so far as to say that using any pillow but your own will result in poor sleep. In my recent experience, the pillow was too thick and fluffy. I sleep on my stomach; back-sleeping is not an option for me. So, when I lay my head upon the pillow, my head sunk into the fluff, which then covered my nose and mouth. Now, think about that for a minute – there’s a reason so many movies, television shows and books feature a murder where a pillow is held over a person’s face. Asphyxiation is not pleasant, not at all. There were two options for me regarding this pillow – either I could put my arm on top of it, thereby compressing the fluff directly in front of my face, or I could shimmy down a few inches so just the crown of my head was on the pillow. I ended up tossing and turning all night. 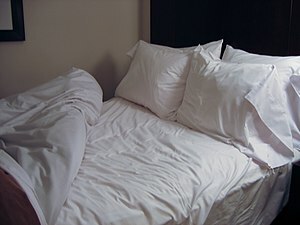 Turn over, pillow covers mouth and nose, wake up gasping for air, compress the pillow or shimmy down. Et cetera, et cetera, so on and so on, blah blah blah. It’s nights like this that I end up scolding myself for not bringing my pillow with me when I travel. I sometimes remember to do this, but when packing for a trip I tend to forget things like pillows, or toothpaste, or what have you. But out of everything, I think my pillow makes the biggest difference. How about you? Have you ever brought your pillow with you on a trip? If not, will you now? Do you think a pillow can make all the difference? This entry was posted in Thoughts and tagged Bedroom, Health, Life, Personal, Pillow, Sleep, Travel, True Story. A-ha! See… there’s one difference between men and women: Checklists. I’m more a typical guy in that I just grab a few clothes, toiletries, and whatever else I think of, and pack them in a suitcase as close to departure time as possible. Naturally, it must be as little as possible, too. My wife, on the other hand, has checklist upon checklist, packs extra clothes “just in case,” and tries to get it done days in advance. Perhaps start sleeping with a towel? Then no one will question it because it is your towel. They’re incredibly useful. Ford Prefect taught me the same thing. I nominated you for the blog on fire award! Just posted it today!